When we first visited the Memorial Museum of Cosmonautics in Moscow, devoted to the Soviet and Russian space programme, Mama thought that space, its vastness, its inhospitable nature and the problems of how to stay there successfully went a bit over my and my Cosmic Big Brother’s head. At that point we were only visiting Moscow, we were both six and under, and I was quite concerned about some of my toys. They were not where I was. I kept asking Mama if they were in my far far away home. She said yes. I was reassured for another ten minutes, while Mama was delighted. Not, I hasten to explain, because I was undergoing angst. But because she thought I had understood something important about the abstract concept of place. What I say is that you would have had to be very dim indeed, or y’know, two or something not to grasp the distances involved when you have got on a train for ages, a plane for ages and ages and ages, a train for ages, an underground train for ages, and then still had short bus ride to go. But space, I’m told, is even further away. And I did spend quite some time thinking that Moscow was a magical fairyland up in the clouds, because I tended to be asleep for the down bit of the journey. You can see Mama’s concern. Particularly as there are also actual adult people living today who think that the world is flat. On top of this, modern life being in many ways indistinguishable from magic, the sheer effort involved in chucking a big tin tube into outer space past the gravity sucking forces and cosy atmosphere bubble is easy to dismiss. Even when it comes back more or less intact. I mean, it’s alright, but it’s no carrying a talking super computer connected to the collected wisdom of humanity (plus cat pictures and Bejeweled Gem Swap Invasion 7) around in your pocket, is it? Surely there’s an app for that? However, the good news is that you cannot spend three years living in Russia without gaining a bit (ok, a lot) more appreciation of the whole undertaking. Or the idea that being first to *cough* almost *cough* everything to do with the cosmos is a thing to aspire to and be proud of. So Mama now has to lean somewhat less hard on her not considerable knowledge of physics and engineering to engage us on our visit to the Space Museum, and can rely somewhat more on that of my Cosmic Big Brother. Who has been on school visits. And has internalized a number of factoids he finds interesting about the exhibits. Which he is more than happy to share. Naturally, as it involves animals, chief among those is the life story of the space dogs, Belka and Strelka, the first two living beings to make it to space and come back alive (give or take a few mice and fruit flies). Did you know that after they landed they were never fed conventional dog food again, but only the very choicest of meaty morsels? You do now. And when they died, they were stuffed and put on display in the Moscow Memorial Museum of Cosmonautics in the opening gallery devoted to some of the famous first flights. Now that’s fame. Luckily for her, Valentina Tereshkova is still alive and unavailable. Mama wonders how close Yuri Gagarin was to sharing the same fate. But Sputnik is there, and that’s pretty cool, as are the first satellites to orbit various heavenly bodies, significant space suits and a film loop of footage surrounding the most significant space race milestones. Clips of take offs, engineers fiddling with equipment, the great dog/human cosmonauts themselves waving, and shots of ordinary people’s reactions to the news of what had happened. The great engineering brains behind the endeavour are not forgotten either, but they too are given a human touch. Not just their medals or items from their professional lives are on display, but photos of them relaxing at the datcha alongside their personal chess board and so on too. Also in this section are some of the spaceorific souvenirs created to commemorate all of this worthy activity. Which, this being the Soviet Union, were mostly in the form of lovingly hand crafted porcelain items rather than mass-produced plastic tat. This is Mama’s personal favourite, although she would like to point you in the direction of the very (very very) obviously female cosmonauts in the other display case. The engagement of children and adults alike is also enhanced by the fact that the Cosmonautics Museum is visually stunning too. The sputniks, rockets, landing crafts, satellites and probes which litter the place are objects d’art in their own right. The first room you enter has lighting designed to simulate a particularly impressive starry starry night, which makes all the shiny metal things twinkle and the marble floor gleam. The main exhibition hall has a space mural painted over the ceiling. Something which I was particularly delighted to point out to Mama. And it is surrounded by aluminum walkways, almost giving Mama the impression that she would at any moment be ushered into a space craft and countdown will commence. If you are in any way photography minded, this means you will want to invest in the special pass. You can take pictures with your phone for free, but for an actual camera you need to pay extra. Mama made the mistake of not realising the first time she visited how very photogenic the Moscow Memorial Museum of Cosmonautics would be. By the time she noticed, she was too far in to go back. Mama’s photography skills are not improved by having to hide behind Papa to snap shots very quickly, so this time we went she ponied up the 230 roubles immediately we arrived. Of course, you can see inside the rockets too, and actually tour a mock-up of the original space station, MIR. Where we were delighted by the computer stuck to the ceiling, the space toilet, and the fish tank. And then you can roam around in the section about how cosmonauts live, when they are preparing for space, when they are in space, and when they land. Check out the space fridge! And the very natty training uniforms. And lots of pictures of smiley people clearly having a whale of a time while whizzing round and round the Earth, pondering the insignificance of humanity’s place in the universe. And this, which my Cosmic Big Brother somehow still managed to make all about animals. It’s the emergency kit for cosmonauts who have landed to help them survive until help arrives. Note the gun? That’s for shooting wolves, apparently. Aaaaaaaaaaah, Russia. Just underneath MIR, you can see a re-entry capsule that actually was in space, which you can tell because of its impressively incinerated look. Look out for this mottling elsewhere to reassure you they have not just emptied out the space programme’s cupboards of all the spare, unused space-going, possibly a bit substandard machinery. The last area is when international co-operation in this great undertaking is celebrated, specially in detailing the work of the International Space Station. We were terribly excited to see the UK flag up there. Hurrah for all two of our astronauts! It is sobering, though, to note by looking at the wall of Soviet/ Russian cosmonauts, just how few people of any nationality have been up on the cosmos in the last 70-odd years. If all of this attention to the pinnacle of human ingenuity has made you hungry, there is now a cafe open on the premises, in which you can buy some very reasonable pizzas, and souvenir space food. Mama was rather upset not to be able to get dehydrated space ice cream and recreate the thrill of when Grandad brought her some on his business trip to the US space centres when she was a child. However, with careful consideration, we got some chicken-and-potato-in-a-tube to take home. After much delighted faffing about with the nifty self-heating pouch, it was a bit of a let down to discover that what was inside was perfectly palatable. But then none of us is all that far removed from the pureed baby food era of family life, so this judgement is perhaps not representative of the reaction of the population at large. They have also set up a proper souvenir shop in the Moscow Space Museum foyer, although Mama thinks they need more interesting mugs, and also wonders why they do not sell the space food there. We just wanted the Belka and Strelka toys. And magnets. And, I dunno, pencil sharpeners. Whatever there are the cute space dogs on really. Although I was also impressed by the professional looking telescopes. What they have taken away since our last visit are the very blue, very plush, very strokable rope barriers. Noooooooooooooo! But probably sensible, given that you were not supposed to touch them. Mama likes to think the decision was made after she helpfully pointed out this problem in our original post about the Cosmonautics Museum in Moscow. The museum does still have the best entrance marker of any museum evah. A sliver rocket soaring on a silver smoke trail elegantly high into the sky. At its base are two very Soviet murals, whose supermen (and dogs) marching gloriously forward into the heavens does not, in this instance, look at all overdone. Mama had been admiring it for years before she ever made it into the museum. Do not dither in the same way yourself and do not let the shiny distraction of the new Cosmos Pavillion in VDNKh, or the fact that you can go on a tour to Star City, the actual current cosmonaut/ astronaut training area outside of Moscow, distract you – the Memorial Museum of Cosmonauitics is still very very worth visiting. It’s important, it’s interesting, it’s beautiful and it’s really really well air-conditioned. This post has been considerably revised from the original 2014 version after a recent visit. 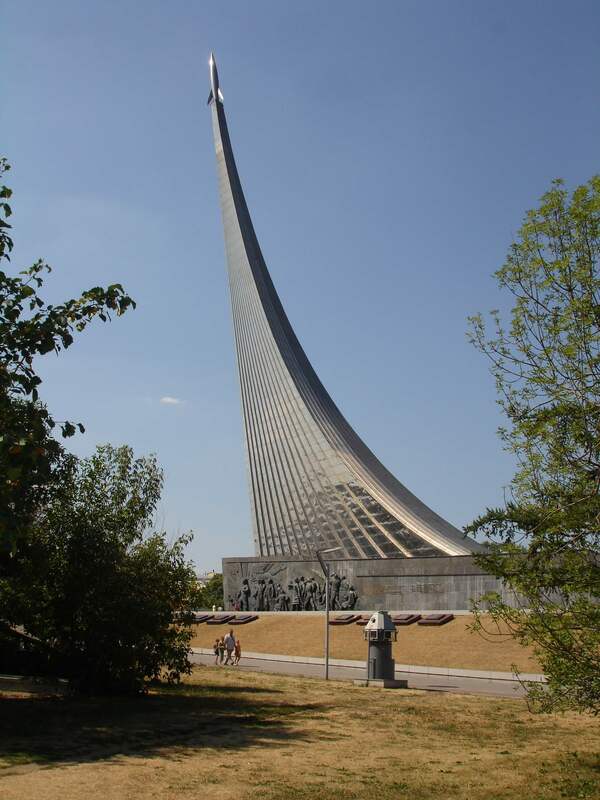 The Memorial Museum of Cosmonautics website (in English). This is what the Hitchhiker’s Guide to the Galaxy has to say about the first manned space flight. Opening: 11am to 7pm every day except Monday, when is is closed, and Thursday, when it is open until 9pm. Price: Adults – 250 rubles, Children over seven (and other concessions) – 100 rubles, Children under seven – free. The photography pass (which you MUST get if you have a camera) is 230 rubles. By Metro: The nearest station is ВДНХ (VDNKh) on the orange line. It is about 100m to the museum entrance past a couple of cruise missiles if you come out of the exit near the front of the train (assuming you are travelling out from the centre), but if you choose the exit past the rear carriages, you can walk up a pedestrian-only avenue lined with cosmonaut-planted trees, busts of famous space-programme-related people, stars commemorating important cosmic milestones, and a damn big solar system sculpture-come-sundial. Luckily, whatever exit you choose, you can’t miss the museum. Head for the rocket. Coming to Moscow and not sure what there is to see and do beyond the famous onion domes of Red Square? I am a Brit but I’ve lived in Moscow for well over ten years off and on since 1996. Currently I’m bringing up two Anglo-Russki kids in the capital of Russia, and I’m married to a native Muscovite. This is my guide to the most essential sights for first time visitors to Moscow, as well as other cool, interesting and unusual things you might want to look out for if you have a bit more time to look around. Obviously you are going to have to visit Red Square, with St Basil’s Cathedral, the iconic image of Russia as its focal point. You can even go round the church, built in the 16th Century by Ivan the Terrible. St Basil’s is colourfully painted throughout, with tiny winding staircases leading to a succession of dimly lit, atmospheric chapels, all richly highlighted in gold leaf. Sometimes there are also singers. If that experience is not spooky enough you can also visit the mummified body of Lenin, still in his stylish boxy tomb next door to the cathedral. Shuffle past Lenin, ignore the smell, and don’t try to talk or pause or the guards will… frown at you. Then you can go and see the graves of other famous revolutionaries (and Stalin) in the walls of the Kremlin outside. Want to see what high-end shopping looks like in Moscow? Nip into GUM, the former Soviet state department store, now thoroughly revamped. Its pre revolutionary roof is a work of art, as are its ice creams. Eating one is a Russian tradition, one of the things you must do in Moscow whatever time of year you visit. Red Square is freely accessible most of the time, except when Lenin is receiving visitors or there is a public holiday which requires celebrating with a parade. The opening hours for St Basil’s are 11am to 6pm in summer and for Lenin’s mausoleum, Tuesday, Wednesday, Thursday and Saturday 10am to 1pm. Read more about what to see and what (not) to do on Red Square here. Of course, one thing you may have discovered while visiting Red Square is that St Basil’s is not, in fact, the Kremlin, and the dead centre of Russian political power is also somewhere you can’t miss on a visit to Moscow. Inside you can admire cathedrals with Tsarist connections, neo-classical government buildings, a cracked bell, some formal gardens, lots of cannons, a really hideous Soviet-era concert hall, and the Russian president’s helipad. On Saturdays from April to October you can also watch an elaborate changing of the guard ceremony, although there is also a more modest version every hour or so outside the Kremlin walls at the Tomb of the Unknown Soldier. Lots of high kicking marching and saluting. If you pay a bit extra you can go to the Armoury and look at national crown jewels type treasure. You might be thinking the communists would have got rid of it, but you will be wrong. There will be a lot of bling. Some Faberge eggs. It will all be exceeding shiny. The Kremlin is open every day except Thursday. The Armoury costs extra for entrance at two-hour intervals. You need to book your visit on the day, but you can do this via the internet as well as in person. Prefer some fresh air? If you wander down to the river you can check out Moscow’s newest public open space, Zaryadye Park. It is definitely one of THE spots to go and get your Instagram on – in particular you should head for the bridge that sweeps out into the middle of the river for an uninterrupted shot back up towards Red Square and the Kremlin. Designed by the same people who are responsible for the High Line in New York, it also contains an open air amphitheatre, an underground glacier and a multimedia experience showcasing Russia’s manifold beauties. And the park itself is designed in zones to represent the different climates and flora of the very large territory Russia currently encompasses. This post covers what happened just after it was opened, and why it lived up to its tagline of ‘wild urbanism’. Just up from the park in the summer season you can catch cruise boats which will allow you to drift comfortably down the Moscow River taking photographs of many of Moscow’s top attractions as you go. Sail past Zaryadye Park again, the Kremlin (the best views are from the river), the reconstructed Cathedral of Christ the Saviour (see below), the former Red October chocolate factory (it’s very red, you can’t miss it), the GIANT statue of Peter the Great (there are no words), and get off at Gorky Park, although you can choose to go on for longer too, and admire one of the main stadiums for the 2018 FIFA World Cup, some of the tallest skyscrapers in Europe, as well as a lot of trees. Read more about cruising down the Moscow river, including what to look out for and why, here. Cruises also run during the winter too, but those only start and finish in Gorky Park. Gorky Park is a much bigger space than Zaryadye Park and in the last few years has been completely renovated. It now has a large number of (variously) cafes and food stalls, flowerbeds, artfully scattered lounging cushions, boating lakes, open air theatres and cinemas, playgrounds, free yoga and dance classes, fountains, sports facilities, random hip happenings, places you can hire bikes, and a huge outdoor ice rink (in winter). You can also nip back towards Peter I (you can’t miss him) and check out the park, Muzeon, directly opposite Gorky Park. This started out as the dumping ground for defaced Soviet busts, figurines and towering 3D representations of people like Felix Dzerzhinsky, the first head of the KGB, which were torn down at the end of the Soviet period. But it has mutated into something a bit less bitter over the years and now has all sorts of other sculptures for you to wander around and wonder about. Still, if you want to get a selfie with Lenin, this is the place to come. Both Gorky Park and Muzeon are free to enter. Opening hours are roughly equivalent to daylight hours, and more about the origins of Muzeon can be read here. Want to find out more about how the statue of Peter the Great came to be imposed on the Moscow skyline? Read this. Travelling around Moscow, you will have already noticed that the fact that there is a park to deposed Soviet statues does not mean that there aren’t any hammer and sickles on display elsewhere around the city. If you are looking for traces of Moscow’s communist history, it’s easy to find them. Leave Red Square, for example, along Nikolskaya Ulitsa at the far end of Red Square from St Basil’s, and at the top of this attractive pedestrianised street you will find a giant mustard-coloured building. This is Lubyanka, the former headquarters of the KGB and now the actual headquarters of the FSB. No, you cannot visit. But you can look at the monument to the many people who died in the Gulags off to the right, on the spot where the statue of Dzerzhinsky used to be. More cheerfully, to the left (yes, right next door) is the Central Children’s Department Store on Lubyanka, which back in the USSR was much more snappily named Detsky Mir, or Children’s World. Even if you don’t have kids along, you might want to pop inside because you can go outside on a viewing platform at the very top of the building, giving you an excellent view over Lubyanka, and the rooftops back towards the Kremlin and Red Square. The fact that you can indulge your inner child on the way up with one of the bigger Hamley’s stores, a 2018 FIFA World Cup merchandise shop, and all sorts of interactive games in the corridors is surely just a bonus. The Central Children’s Department Store on Lubyanka is open from ten am every day and closes at ten pm. Read this post if you want to find out more about this venue. If you want a real USSR experience, though, you should head out of the centre to VDNKh. Begun as an exhibition space to show off all of communism’s finest achievements from the small (breeding a lot of pigs) to the large (first man in space), this very enormous park is dotted with all sorts of pavilions to things such as Armenia, honey and electromagnetic engineering, which are both very Soviet in design and extremely attractive. It’s fun to wander around and admire the architecture, but nowadays the pavilions also contain a number of very visit-able attractions, including an aquarium, an interactive science museum, an illusion factory, an urban farm, art and history exhibitions, and a space shuttle you can go inside. In addition (but do you need an addition? ), right next door to VDNKh is a whole museum devoted to space exploitation, which is an absolute must-see for anyone with any kind of interest in space rockets, space dogs, space chess sets and space ice cream and has the added bonus of having the most fabulous roof-top sculpture of any museum on the planet. And! In winter they build one of the largest outdoor ice skating rinks in the world so you can skate past the pavilions of VDNKh, and then whizz down a tubing run that winds round an actual space rocket. VDNKh is found a fifteen minute journey from the centre of Moscow half way up the orange metro line, and is open all day. For more about the history of this remarkable space as well as what you can do there, read this post. Of course there is always the actual museum to the revolution, including its build up and its consequences right up to the present day, although now it bills itself as a Museum of Contemporary History rather than out-and-out devoting itself to the formation of the USSR. Unfortunately, it is currently undergoing a renovation, so the main halls containing really interesting artifacts relating to the period, significant moments, and famous and more obscure heroes and villains are closed. There are temporary exhibitions for the real enthusiast. But it is cheap and central, being on the main drag down to Red Square Tverskaya Street, just up from Tverskaya/ Pushkinskaya/ Chekovskaya metro stations. And since it is housed in the former English Club, a gentlemen’s hang out for expat Brits and Anglophiles in Tsarist Russia, it’s in a really nice-looking building. Closed Mondays. Do not ever try to go museum visiting in Moscow on a Monday. This is almost always the day they have off. The Kremlin is the exception. The last Friday in every month is also often not a good idea, as this is also usually another closed day. On the upside, if you are in town, on the third Sunday each month and some public holidays, a large number of museums are free. There will be queues for the more popular ones, however. Top of the list of more off-the-beaten-track Soviet-related locations to visit is Bunker 42, where you can relive the Cold War. Be prepared to walk down many many stairs, and go deep deep underground to find out where the Soviet leadership intended to ride out any attack the West could throw at them. To visit you have to be part of a tour, and it’s pricey compared to many of the other museums and experiences in Moscow at over 2000 roubles per person for the English language excursion. It may nevertheless still be worth it. To fortify you for the slog back up the stairs, there is also an underground cafe down there. Another museum which aims to look at the less palatable aspects of the Soviet Union is the Gulag Museum, about the extensive network of labour camps for political (and other) prisoners. Open every day (except Monday) from midday, it is between Dostoyevskaya and Tsvetnoi Boulevar metro stations. If you want to look at really big guns, then the Central Armed Forces Museum is for you. It covers the whole history of the Red Army, although the Second World War dominates. Called the Great Patriotic War in Russia, this might give you some understanding of how brutal it was on the Eastern Front. But as well as some very sobering dioramas of the horror that was Stalingrad, triumphal collections of captured Nazi flags and other such aide-memoires, you should be able to find all the uniforms, tanks, planes, armoured vehicles, and weapons big and small you could possibly want, and the actual American U2 spy plane shot down by the USSR in 1960 to boot. There isn’t much English language support, but its appeal is very visual even if you don’t know your AK47s from your AK74s. There are handling opportunities too, although not going so far as to let you actually fire the things on display. The Central Armed Forces Museum is to the north of central Moscow near metro station Dostoyevskaya or Prospect Mira and open every day except Monday and Tuesday. Somewhat further out from the centre is Victory Park and another museum which is closed on Monday. This time it is exclusively about the Second World War. In case you weren’t sufficiently convinced by the Central Armed Forces Museum about just what a big deal it was to the Soviet Union, Russia, and the allied victory. In fact, although it celebrates the end of World War Two with a giant monument designed by the same person who did the humongous Peter the Great statue you will not have missed on the Moscow River, the park was actually only completed in the 90s. But there are even more tanks round the side of the museum as a reward for coming out here as well as the deepest metro station in Moscow, Park Pobedy. Enjoy the ride up the escalator! The park also hosts various events during the year, many of them entirely unwarlike, such as the Ice Sculpture Festival in the New Year holidays. If you want to find out more about the other disastrous land war in Eurasia, then right next to Red Square is a museum devoted to the incautious invasion of Russia by Napoleon Bonaparte. It’s not actually the blood-red gothically detailed State Historical Museum which dominates the other end of Red Square to St Basil’s, but a subdivision next door. The State Historical Museum is itself interesting for those who want to look into pre-twentieth century Russian history. Right back to prehistoric times. For non-Russian speakers it is essential to get the English language guide, as most of the objects in the museum have been selected because they have an interesting story attached rather than being merely representative. You will want to hear about them. This museum is, wonder of wonders, NOT closed on Monday or any other day. Read this post for more about what you can see at the Historical Museum, and why you shouldn’t tell your children that most things from deep history are found in graves. It’s not often that affordable, everyday and extremely practical means of travelling around are recommended in a guide to the top things to do in any given city, but there is a reason why it keeps coming up for the Moscow Metro, and that is the outstanding station design. You don’t need an interest in trains to appreciate the ceiling shapes, the light fittings, the many and varied artworks, the marble, the statues, the door details, and the columns. The project began with the intention of building a series of people’s palaces (and to glorify the Revolution through the medium of public transport) and you have to say that it was a success, although they throttled right back after the first wave of construction. What this means is that most of the really spectacular stations are along the circular brown line, so it is simplicity itself to tour them. Other notable stops are Ploshchard Revolutsii, the nearest stop to Red Square on the dark blue line (Soviet superpeople and animal statues, rub dogs or chickens for luck), Mayakovskaya on the green line (look up), and most of the stations on the dark blue line going East, which conveniently takes you to Vernissage souvenir market (see below). However, the Moscow Metro is still under construction, and some of the newer stations in the south have also been decorated with an eye to making a functional space delightful once again. To compare the old and the new, the southernmost stations of the red line might be worth a journey, plus you’ll get to go through the station which is actually on a bridge of the Moscow River!!! And also right next to the 2018 FIFA World Cup stadium. To find out more about how to use the Moscow Metro, its history and what stations are essential viewing, read our guide. If you are interested in seeing the Soviet Union through the eyes of its artists, you can visit the large rectangular box like building you will not have failed to notice while you were visiting the fallen statues of Muzeon. This bit of uninspiring architecture houses the New Tretyakov Gallery, a museum to the Soviet avant guarde and what followed it. Really worth a look if you have any interest in Kandinsky, Malevich and enormous canvases of Stalin twinkling avuncularly down at you. If you prefer your art more contemporary, just inside Gorky Park the Garage art gallery is one of the most likely spaces in Moscow to find out what Russian artists are up to now although it also has a lot of exhibitions by international names. It’s not very big, so easy to pop in and out of, and there is a pleasant sort of cafe, if none of the ones in the rest of the park appeal. There is also the relatively new Moscow Museum of Modern Art, which has five locations all over the city and a wide variety of exhibitions, as well as the Moscow Multimedia Museum, which has Lego stations in the foyer. Their websites will tell you if there is anything on which you feel particularly drawn to, but for a flavour of what you can see at any of them, click on the links in the text above, which also give more information about the locations, costs and the fact that they are closed on Monday. And if you want to see just how hipster Moscow’s trendy art and design scene can get, check out the former Red October factory just down from the Kremlin and next to Muzeon, although this is rather better for hanging out in cafes and bars. So also go to Winzavod or the ARTPLAY complex in the east, down from Kurskaya/ Chkalovskaya metro, or Flacon in the north near Dmitrovskaya metro. That said, when it comes to art, as a tourist, you’ll usually get directed to the Old Tretyakov Gallery which is back up the river a ways, on the south bank not that far from Red Square. Its building is much more attractive than the New Treatyakov Gallery’s, and its art is pre revolutionary. You are unlikely have heard of any of the artists, but if you get hold of one of the many-languaged audio guides, by the time you come out, you will have a decent working knowledge of the whole of the history of Russian art, and a serious bear and birch trees addiction. Or you could go to the Pushkin Museum of Fine Arts, which is full of the paintings the Soviets acquired in the Second World War, among other things. Lots of Impressionists and Picasso and so on. Also, many life sized plastercasts of great works of art from around the world for the edification of Soviet citizens who were unlikely to be able to see them in person. The Old Tretyakov Gallery is at Tretyakovskaya/ Novokusnetskaya metro stations, and for an overview of what you can see there and why it is interesting, read this post. The Pushkin Museum of Fine Art is near the Christ the Saviour cathedral (see below) at Kropotkinskaya metro station. Both of them are closed on Mondays. Of course. As well as visiting the gallery, you might also want to have a wander around the area surrounding the Old Tretyakov Gallery, the south bank . This being one of the places you can see what Moscow looked like before the revolution, full of low-lying pastel-plastered mansion houses, sometimes even still wooden or partially wooden. There are also 19th century factory buildings, as well as a whole bunch of churches. Walking away from the Kremlin down either Novokuznetskaya or Bakhrushin Streets towards the metro station Paveletskaya will give you an overview. Prefer a more art nouveaux vibe? Then the back streets near the Old Arbat street are where you should attempt to get lost. Maxim Gorky’s house is a particularly famous building, having been designed by the architect Fyodor Shekhtel for businessman Stepan Ryabushinsky in the early 1900s before it was handed over to the writer by Stalin himself. You can go round it, and if you do, be prepared to be particularly impressed by the staircase. In fact, there are quite a lot of flat, house and country estate museums dedicated to the writers, artists and performers who lived in them, so if you have a favorite look them up and see if you can go and see where they ate, slept and worked. One of the most enthusiastically celebrated is Mikhail Bulgagov, of Master and Margarita fame, as there is not one but two quirky house museums to his life and works in his former apartment block. One of them is the place where Bulgakov located the Devil’s abode in Moscow. Graffiti covered stairs, art installations, theatrical performances and a bus tour of the area are also available. Read about our visit here. Of course, if you are a tourist in Moscow you should almost certainly take a walk down the Arbat street itself – it’s that kind of place. Why is the Old Arbat famous? Well, it is one of the oldest streets in Moscow, and one of the major routes in and out of the city for friend and foe alike. Originally lined with artisan’s workshops, eventually all the aristocrats had their palaces here. Later it developed more of a middle class medical and legal vibe before the artists, writers and poets moved in to make it the bohemian quarter. More recently, in the 1980s this is where you could go to help kick start Moscow’s headlong jump into the wild waters of capitalism by getting involved with the black marketers exchanging jeans and foreign CDs for Soviet memorobillia. It was, therefore, a cool, edgy hangout, and the posibility of having a run in with the police, high. Scruffy teens still to this day occasionally persist in turning up and trying to look cool by playing rock songs on their guitars. But they are fighting what is probably a losing battle with the pleasant cafes, souvenir shops and stalls, and professional street entertainers of the type you might find in Covent Garden in London or along the Royal Mile of Edinburgh. You might want to check out the Kino wall, though, a much graffitied monument to Russia’s most famous underground rock star, who died unfortunately young. If it is still there. What with clashing with the new genteel vibe and all, there are rumours it is about to be painted over. Catch it while you can. To get to the Old Arbat, you can either get off the metro at Smolenskaya and walk down the street towards the Arbat metro station (another one of the pretty ones). Or do the trip the other way. This experience is equally as fun in the evening as during the day. To find out more about Soviet underground rock, read this post. Another great place to shop for your matryoshka doll is Vernissage at Ismailovsky Market. This sprawling outdoor complex combines a large number of arts and crafts vendors, souvenir emporium, fine arts gallery and a flea market, and is housed in a colourful fairy tale wooden kremlin recreated from the 17th Century. The main buildings are popular as a wedding venue, but there are also little museums to vodka, bread, folk art and child delinquency if you have had your fill of admiring the attractive wooden stalls and their contents, and there will also be outdoor entertainments such as live action blacksmithing for you to enjoy. Vernissage is open from 10am all week, but for souvenirs and shopping you really want to go there at the weekend as during the week the number of stallholders is much reduced. This post tells you a lot more about how very very fabulous Vernissage is, and what else you can buy there. What more can Moscow’s parks offer? Vernissage is right next to one of Moscow’s many excellent and very extensive parks, in this case Ismailovskiy Park, although this particular urban wilderness is probably of more subtle interest to the casual visitor than others with more obvious tourist attractions. Such as Tsaritsyno in the south, which has a full sized replica of the original 18th century royal chateaux built for Catherine the Great, striking orange and white outbuildings, and a dancing fountain. There is also Kolomenskoye, which has one of the oldest churches in Moscow, Peter the Great’s modest cabin and a full sized replica of the original 250-room wooden royal palace of Peter the Great’s father to go round, as well as horse drawn carriage or sleigh rides (depending on the season). These parks are situated quite close to each other in the south of Moscow along the green line, but that doesn’t really mean you should attempt both on the same day. You’ll want Tsaritsyno metro station for the gingerbread gothika, and Kashirskaya or Kolomenskoye stations for the 8th wonder of the Medieval world. Read more about each location in this post for Tsaritsyno, this one for Kolomenskoye, and this one for the palace. Moscow’s architecture is very much bound up in its churches. Moscow was once known as the city of 500 000 000 cupolas (at least), especially in comparison with its more secular and classically inspired neighbour, St Petersburg. With the fall of the Soviet Union, the Orthodox church took back many of its buildings from their communist occupation by libraries, cinemas, museums, housing, communal gyms, public toilets, factories, storage facilities and other community projects returning them to the gorgeously decorated places of worship they are again today. The biggest restoration project in Moscow of this kind is the Christ the Saviour Cathedral on the Moscow River, just downstream from the Kremlin. The cathedral was demolished by Stalin to make way for a giant revolutionary monument and Soviet palace, which was to be the biggest such structure in the world. Unfortunately, the soggy banks of the Moscow River proved unsuitable for building something so large and so the foundations were turned into an outdoor swimming pool. Today, it is once again a huge, gleaming, white marble-cladded gold-topped cathedral, built to the original specifications. You can visit it and admire the frescoes and icons inside. As well as the religious space, there is also an art gallery in the basement. The cathedral is open 9am to 7pm throughout the week, services willing. As with many religious establishments, they prefer tourists to dress modestly. It is traditional for women to cover their hair, and if you plan to be looking around a lot of churches, a head scarf might be a useful thing to have in your bag, should you be of the female persuasion. Men should remove headgear, and no-one should hold hands. It’s bad luck, apparently. Further along the river, near the 2018 Fifa World Cup football stadium, is Novodevichy Convent, which as well as remaining one of a number of working Orthodox christian monastic orders in Moscow, is notable for its cemetery, which contains the great, the good and the extremely notorious, as well as very striking headstones all round. Krushchev, Chekov, Gogol, Eisenstein, Bulgakov, Molotov, Mayakovsky, Shostakovich, Ilushin, Yeltsin and many more are buried here. You can buy a map of the graveyard at the entrance. You will not have missed, while looking round Novodevichy, the towering glass buildings of Moscow City, or the International Business Centre as it is supposed to be called, as these are right next door. There are some genuinely striking bits of modern architecture here, but the real area of interest is that this complex houses the second tallest, the third tallest, the fourth tallest and the sixth and seventh tallest buildings in Europe (the tallest is now in St Petersburg, and the fifth tallest is in London). And you can go up the skyscrapers and look down over Moscow from unfeasibly high up, if you should so wish. Decide if you want to spend the money, and read about our experience on one the tours to the Moscow City viewing platforms here. However, the classic place to go if you want to stare at Moscow from above is the Ostankino TV Tower, still the tallest structure in Europe, even if it has been eclipsed by buildings with proper floors in lists of such things. As a bonus, it is lit up at night, and has a revolving restaurant, as well as a glass floor in the 360 degree observation deck. Find Ostankino Tower close by to VDNKh, where it is virtually unmissable if a bit of a walk from te metro. Bring your passport as they won’t let you in without it and check the weather before you go – clouds may well obscure the top of the tower. Russia is deservedly famous for its ballets, and there can be no better location to see one than the Bolshoi Theatre just off Red Square. The historic stage is the one for the full on gold leaf, red velvet, boxes and balconies experience, but other venues under the same company’s umbrella are available, if less prestigious and lacking in really sumptuous architectural detailing. Booking is now possible online, and in advance. If you want the thrill of walking into the Kremlin as more than just a tourist, try getting tickets to the Kremlin Ballet, which is housed inside the Kremlin itself. The only downside is that it is held in a considerably less visually attractive building than the Bolshoi. Performances in either the Bolshoi or the Kremlin are unlikely to be radically innovative, but there will be virtuoso spinning and jumping, which is what you want really unless you are really into your dancing. Both of these also do opera for those who prefer singers to dancers. If classical concerts are more your thing, the Tchaikovsky Concert Hall and the venue attached to the Conservatory are also both lovely spaces, central and chock full of performances, also on the more traditional end of the spectrum. Less highbrow but equally as essential in order to experience the full range of traditional Russian entertainment options is a trip to the circus. In Moscow these have permanent, specially constructed buildings, such is the seriousness with which this art form is taken. The Nikulin Circus on Tsvetnoi Bulvar is bang in the centre, and the Great Moscow State Circus on Vernadskogo is rather bigger but further out in the south west, near the University. Both have all the acts that you might expect, traditional and less so, visually spectacular, breathtakingly nerve-wracking and laugh out loud funny, with no need to understand Russian to enjoy them. But be warned; those have opinions about performing animals should steer clear. To be honest, there are so many venues big and small all over Moscow for all sorts of shows, that if none of the above appeals but you want a dose of the performing arts then there will be something out there for you, even in summer when traditionally the big companies go on tour abroad. You want ice dancing? Indie bands? Puppet theatre? A musical version of Anna Karenina? A-tonal string quartets? Elton John? Depending on the season and day of the week it will be there. There is also a thriving nightlife in Moscow with cafes, bars and clubs to suit every taste too. When the weather is nice in the summer months you can just stroll around the pedestrianised centre, starting at, say, Tverskaya Street just behind Red Square, immediately making a sharp right along Kamergerskiy Pereulok, and then you just keep wandering along from there, investigating any side streets that look interesting. The evening will be awash with venues that have spilled out onto the broad and accommodating pavements so just take your pick. There will be buskers of all kinds and all sorts of people watching opportunities. In winter, well in winter just get indoors. Hopefully, this has given you ideas about what you can do to fill your time in the capital of Russia both if you are visiting Moscow for the first time or if you have been here before and want to find something a bit different. Of course, it is not an exhaustive list of things to do in Moscow. I haven’t even mentioned the Darwin Museum of Evolution, the theatre of performing cats, the zoo, the train yard with full sized locomotives to climb over, the many many escape rooms (some in English), or the fact that whenever you turn up there is highly likely to be a festival of some kind in the centre with extensive decorations, stalls, games, craft workshops and street performers. For example. But you’ll need to go home eventually, so it might be better to just plan to come back to Moscow another time. Any questions, comments, or suggestions for about what I should have included in my list of top Moscow attractions but didn’t? And if you need some ideas of where to eat traditional Russian food at an affordable price, try here.